Saturated with skin-loving ingredients, sheet masks are the dominating the beauty conversation far and wide — and for good reason. Boasting powerful ingredients and transformative effects, this at-home treatment is the latest in savvy skin technology: a face-shaped fabric infused with a solution of skin-enhancing actives, sheet masks help bind moisture to your skin while delivering all the goodness of the serum. Crafted with an innovative hydro-formula and a biodegradable, non-slip lace fabric, our product partner Aromatherapy Associates' new Hydrosol Sheet Mask leaves skin feeling lifted, firm and beautifully smooth in just ten minutes. Whether you’re getting ready for a special occasion or simply relaxing at home, a boost of our unique active ingredients might just be what your skin is looking for. Responsibly sourced from Eucalyptus wood, this softer than silk, single layer fabric perfectly contours the face, enveloping the skin with an enriching serum of plant-based ingredients and essential oils. 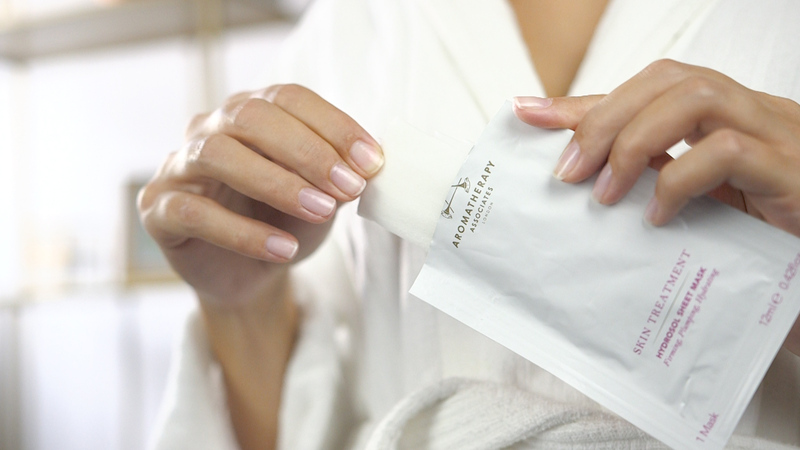 The non-drip formula ensures optimum delivery of moisture and actives, and offers a therapeutic, spa-like experience in the comfort of your own home. Hydrosols, also known as “Floral Waters” are produced during the distillation of essential oils and boast a multitude of properties, from anti-bacterial to calming, regenerative to strengthening. Derived from 100% pure distillate, our Frankincense Hydrosol’s skin rejuvenating properties helps brighten and tighten the skin. Hyaluronic Acid – a gel-like, water-retaining molecule – keeps skin plump and hydrated. Packed with incredible benefits, this deeply moisturising active helps improve production of collagen, fight free radicals, maintain skin elasticity and also comes with antibacterial and anti-inflammatory properties, making it a true skin saviour. Also included is Turmeric Root Extract, which helps improve skin texture and radiance while minimising the appearance of fine lines, and Aloe Vera, rich in Vitamin C and E.
And, of course, no Aromatherapy Associates product would be complete without a powerful essential oil blend – a synergy of Frankincense, Rose and Geranium oils promote a healthy, radiant and long-lasting glow. Pick your £15 Hydrosol Sheet Mask up today online (£42 for four), or from either of our two Thermae shops.